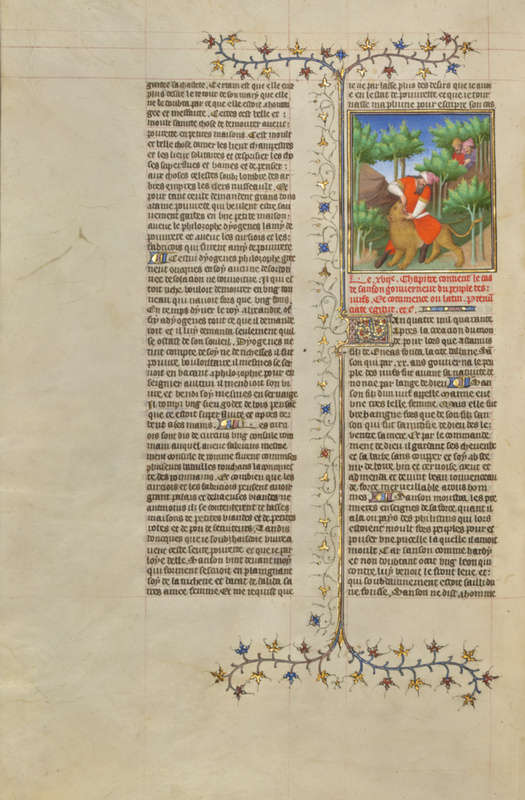 Boccaccio's Concerning the Fates of Illustrious Men and Women includes such Biblical characters as Samson, the legendary warrior and one of the judges of ancient Israel, whose unbridled passions led to his downfall. In this miniature, the illuminator demonstrated Samson's unequaled strength. The bodies of man and beast are united in a pyramid, with Samson's victory ensured more by physical dominance than action. The artist conveyed the weight of Samson's body, the animal's tensile strength, the twist of its neck, and the manner in which Samson holds its mouth open, but without much sense of physical force. The pair seem as much engaged in a ballet as a struggle. In a technique characteristic of this workshop, two figures hidden in the trees at the right witness the scene. They provide a model for the reader of the manuscript, who, by looking at the image, also witnesses the event.